The Resident Tourist: Smart Sipping . . .
As the temps have been shooting up, I find myself reaching for a drink of water more often than usual. I know hydration is an important part of good health but am never quite certain how much I'm supposed to drink. I've heard the eight glasses a day rule, but have also read that it's a myth. On a particularly warm and thirsty Tuesday I set out to find the truth about smart sipping and how to increase water intake. The best way to maintain water intake is to always have water on hand. In your bag, on your desk, by your bed. If you see it, you'll remember to drink it. If you're worried about the environment, invest in a cool looking bottle that can also act as an even bigger visual boost. I just bought a Water Bobble. It's great. Thirst is a warning sign that your body has lost too much water (unless you just indulged in a handful of popcorn or salted peanuts). After thirst comes a headache, muscle cramps, concentration loss, and even an elevated heartbeat. So rule of thumb, don't let yourself feel thirst. And if you do, grab that bottle and get to it. It's better to sip slowly throughout the day than to chug a bottle in one. 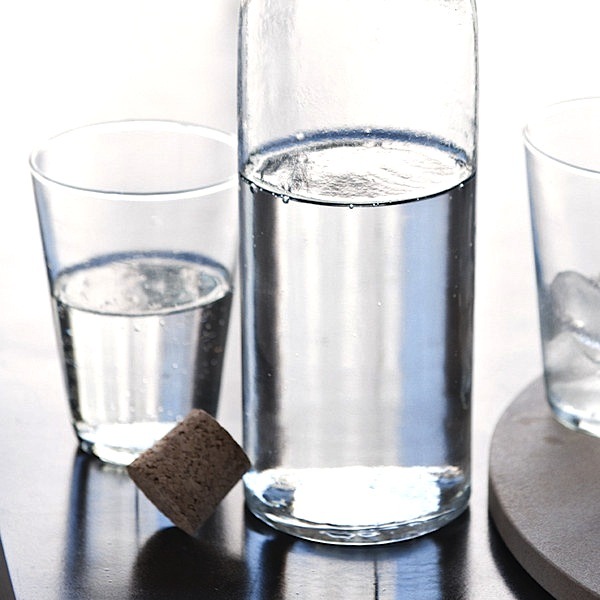 This is mostly for comfort, but if you quickly gulp down a bottle of water you'll feel full (almost sick) which will deter you from further drinking. Small sips won't cause the full feeling and keep you hydrated longer. Hope these come in handy, especially during these warm summer months.